A woman walks along Market Street in Philadelphia during a snowstorm on Nov. 15, 2018. With colder air returning this weekend, a pair of back-to-back storms will bring snow and ice to the Philadelphia region. A prolonged period of unsettled weather is on tap from Sunday into Monday as the Mid-Atlantic is gets caught between high pressure building into eastern Canada and several waves of low pressure passing either south of or across the region, according to the National Weather Service. Forecasters believe temperatures will be cold enough at first to allow snow throughout the region, but arriving warmer air means the snow will mix with sleet and freezing rain in extreme South Jersey after midnight Sunday night and into daybreak Monday. About an inch of snow and sleet, and a glazing of ice is possible in that area. A hazardous weather outlook calls for a wintry mix of snow, sleet, and freezing rain to develop late Monday night and continue through Tuesday. There is the potential for a prolonged period of wintry weather Tuesday and Tuesday night for the southern Poconos, Lehigh Valley, and northern New Jersey. Philadelphia could see enough snow to cover roads and make for slippery travel, according to Accu-Weather. As another area of low pressure develops over the western Gulf Coast states, a frontal boundary is expected to set up ahead of it into the Mid-Atlantic states, the National Weather Service said. That will likely lead to several waves of overrunning precipitation on Monday afternoon and into the night and Tuesday. With enough warm area surging from the south, the moisture will likely start out as rain in the afternoon, turning to snow as temperatures dip, or possibly a rain-snow mix, according to forecasters. A map on the Accu-Weather website shows a potential ice storm forming Tuesday not too far to the west of Philadelphia's westernmost suburbs. Accu-Weather said "another big winter storm" could be on the way late next week. Saturday: Sunny, with a high near 34. Northwest wind 11 to 16 mph, with gusts as high as 26 mph. Saturday night: Clear, with a low around 18. Northwest wind around 6 mph becoming calm in the evening. Sunday: Mostly sunny, with a high near 38. Calm wind becoming southwest around 5 mph in the afternoon. Sunday night: A chance of snow. Cloudy, with a low around 28. Light and variable wind. Chance of precipitation is 50 percent. Little or no snow accumulation expected. Monday: A slight chance of snow before 1pm, then a slight chance of rain. Mostly cloudy, with a high near 39. Chance of precipitation is 20 percent. Monday night: A chance of rain and snow before 1 a.m., then snow and sleet likely till 4 a.m., then freezing rain and sleet likely afterwards. Mostly cloudy, with a low around 28. Chance of precipitation is 60 percent. Tuesday: Freezing rain and sleet before 1 p.m., then rain. High near 40. Chance of precipitation is 80 percent. 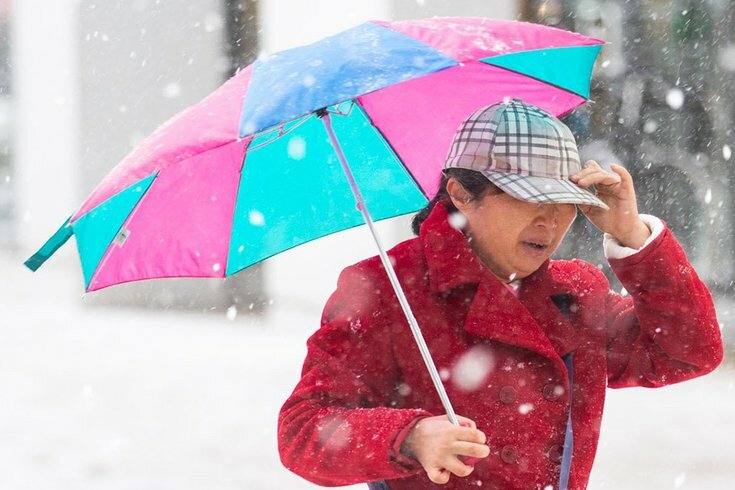 Tuesday night: Rain likely before 4 a.m., then rain and snow likely. Cloudy, with a low around 32. Chance of precipitation is 70 percent. Wednesday: Snow likely before 7 a.m. Partly sunny, with a high near 46. Chance of precipitation is 60 percent. Thursday: Mostly sunny, with a high near 45. Thursday night: A chance of rain and snow. Mostly cloudy, with a low around 31. Chance of precipitation is 40 percent. Friday: A chance of rain and snow. Mostly cloudy, with a high near 49. Chance of precipitation is 50 percent.